My Review: This book is part of a series called Oliver and Jumpy. This particular volume has stories 43 - Flying Carpet, 44 - Birthday Party, and 45 - Magic Berries. It is an excellent gift for parents with children under 8 as suggested by the author. 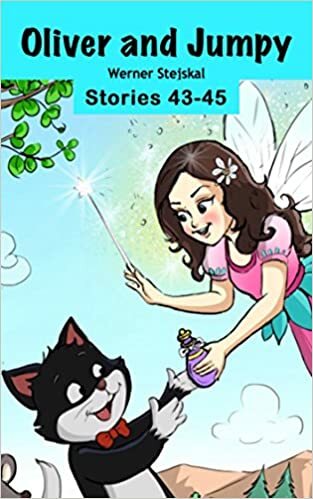 The book is beautifully illustrated by Mario Tereso (Stories 43), Vikas Upadhyay (Story 44) and Maycee Ann Reyes (story 45) and that is a very important plus, as its main audience will rely on the images to follow the stories, as many will not have reached the age to start reading by themselves. 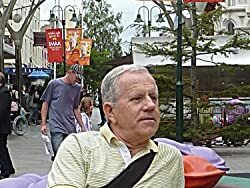 In "Flying Carpet", Oliver goes to Africa to save another princess, but he does not go alone. He takes with him his friend Jumpy! and the adventure starts when they reach Egypt and they receive a flying carpet!. In the "Birthday Party", Oliver is greeted when arriving home with a surprising birthday party organized by his friends. Finally in "Magic Berries", Oliver, Jumpy and Joey are back into Ghost Castle and Joey find some berries and eat them. That causes some side effects. Trying to correct that, he eats another variate of berries and something different happen! Finally they find wood-fairy that takes care of everything and makes things go back to normal! All stories are very sweet and even touching and the characters are always showing good behavior. No violence, nothing too scary or too exciting, it will keep your toddler entertained (but not excited) during that critical bedtime period. They will love the stories and soon enough Oliver and Jumpy will be in their hearts forever.